After the disaster that was my Twix Cake experience I thought I would be avoiding anything chocolate and caramel-related for a long time. But caramelly, chocolately goodness is an evil temptress and I was itching to make a Rolo covered cake. Rolos are an awesome baking ingredient. I mean, look at these beauties. I had also promised Tomred a birthday cake for today (Happy Birthday Tomred!). 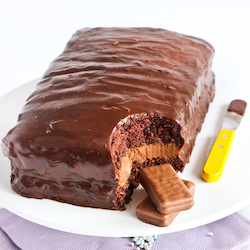 Considering the fact that for Tomred's birthday last year I came up with one of my favourite inventions ever, the Tim Tam Cake, this Rolo Cake had big shoes to fill. About 5 seconds after deciding to make this big-shoe Rolo Cake for Tomred's birthday, I forgot all about it. Completely, totally forgot about it until I was just starting to wake up yesterday morning. A little, nagging thought was poking the edge of my brain and stopping me from getting out of bed to make the banana scones I was planning and then OH SHIZZ I remembered about the cake. I then spent the rest of the morning running around my suburb trying to find ANYWHERE that sold Rolos, because (as per usual) the one thing that I desperately needed was nowhere to be found. I may have been a little too excited when I finally found them and bought about 10 tubes. When I finally got around to making this cake, I realised that it would not be a cake for the faint-hearted. 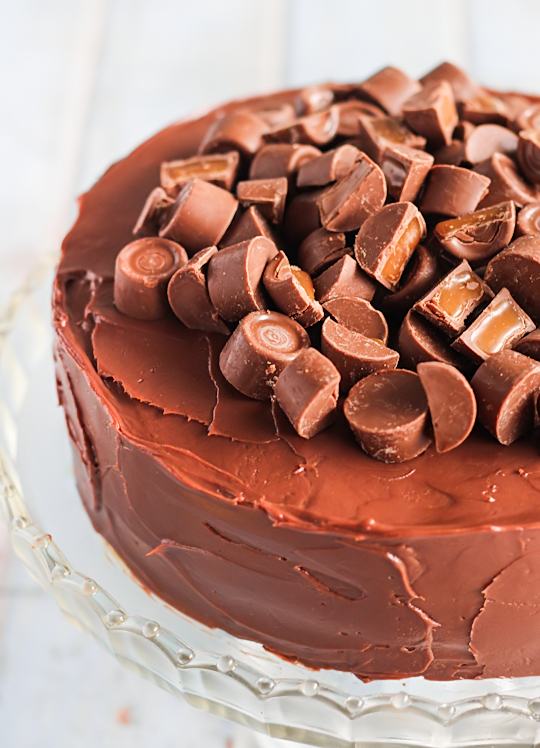 Two layers of fudgy brownie cake (adapted from Lisa's PX Brownie Cake), with a pack of Rolos baked into each layer, a (salted) caramel (dulce de leche to be specific) filling just like a Rolo, covered in a milk chocolate ganache and topped off with a mountain of Rolos. Yep. I won't even try to pretend this isn't decadent and over the top. But I DID try to make it less sickly-sweet and unbalanced by halving the sugar and eggs in the cake. But there is a lot of butter, which is always something I always freak out about when I make a brownie recipe. I used salted butter in the cake and sea salt in the dulce de leche, and made the ganache milk instead of dark chocolate to make it less rich. In the end it's still quite rich, but not enough to make you feel totally ill after a slice. Or three. But one slice is enough! It was so much easier boiling up a can of sweetened condensed milk to make the caramel this time around, rather than worrying about candy thermometers and hot sugar syrups. And it's also so easy to spread swirls of 'rustic' (*cough* lazy & messy *cough*) ganache on the outside. If you're wondering how you're able to see a slice of this birthday cake before the birthday boy has seen it; my workmates and I have an unspoken agreement. They help me finish off most of the baked goods that I make for this blog no matter how strange my experiments are, and they also understand that every birthday cake they get from me will probably have a slice pre-removed for blogging purposes. Hopefully they'll enjoy this cake as much as all the other cakes minus one slice that they've tried. Note: you can replace the dulce de leche and put a layer of Rolos in the middle of the cake instead, now that would be crazy awesome. Preheat the oven to 150°C (300°F), grease and line 2 x 20cm springform tins (or you can bake one cake after another if you only have one tin). Melt butter and chocolate in a heatproof bowl over a saucepan of simmering, stirring occasionally until smooth. 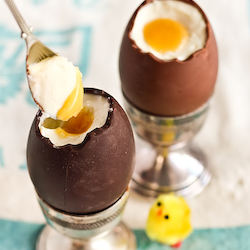 Whisk eggs and caster sugar in an electric mixer until thick and pale (about 3-5 minutes), fold through chocolate mixture then fold in flour until just combined. Pour batter into the prepared tins, smooth top and (if you wish) press rolos over the surface of each cake (1 pack for each) and bake until just firm to touch (25-30 minutes). Cool completely in pan, then very carefully transfer one cake to a serving dish. If you are making your own caramel, make sure you prep it ahead of time so it is cool and ready to be spread at this point. Whisk dulce de leche to remove any lumps, add a couple pinches of crushed sea salt if you would like to have salted caramel filling. 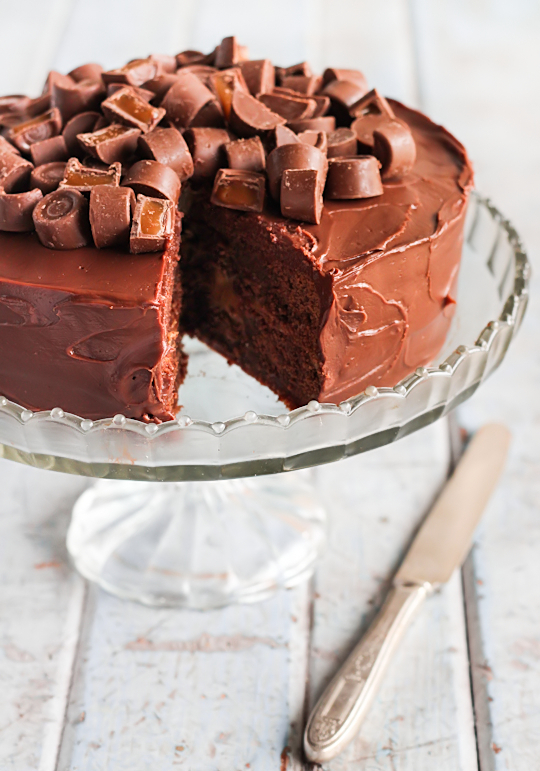 Whisk until combined, then spread a generous layer of caramel over the top of the first cake. Refrigerate this for at least 30 mins, this will keep your dulce de leche firm. Carefully sandwich the second cake on top (upside-down). Don't worry if either of your cakes crack, icing covers everything. Prepare the ganache; place chopped chocolate in a large heatproof mixing bowl. Place cream in a small saucepan over medium heat and bring just to the boil, then remove from heat and pour hot cream over the top of chopped chocolate and leave in bowl for 5 mins. Use a whisk to bring mixture together, if there are still unmelted lumps of chocolate after this, you can place the bowl over a pan of simmering water and stir until it is completely melted. Chill in the fridge until thick but spreadable and just under room temperature (I sped up this process by placing the bowl in the freezer and whisking the mixture every 5 minutes until it was ready). Using a spatula, spread ganache over the top of the cake. Decorate cake with extra Rolos, I chopped half of them in half so you could see the caramel innards. Can be served immediately, or stored in the fridge until ready to serve. Can be stored in an airtight container in the fridge for several days. Wow... how decadent. I'll have to make this for a special occasion! oh wow that looks like some seriously delicious decadence. 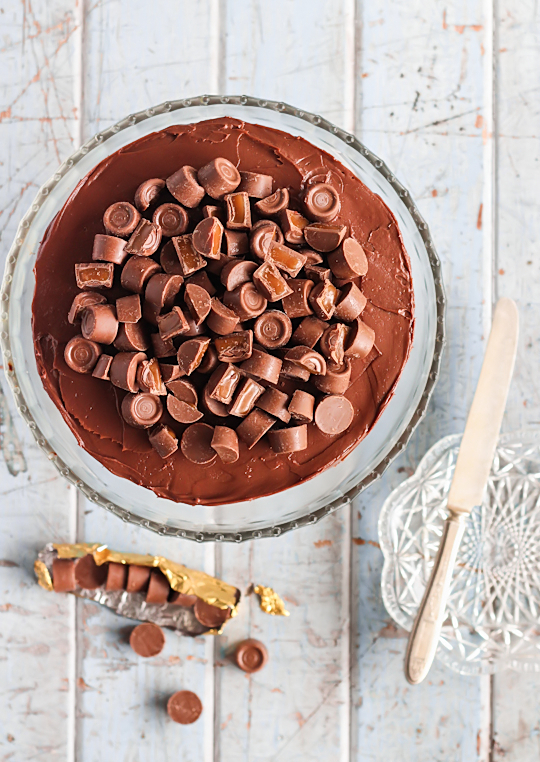 Love rolo's - so making this, a perfect excuse to boil that can of condensed milk in my cupboard! that cake is just freaking insane. that pile of rolos ohemgee I WANT IT SO BAD. Mmmmmn! That caramel layer looks out of control. And as for your cake, well I'm standing up in my kitchen and giving you a standing ovation. It looks amazing. Bravo! This sounds so decadent and awesome! Also I haven't had Rolos in years, must go and try to find some today! I haven't had rolos for the longest time, but I remember eating heaps of them as a kid! Love the unspoken agreement you have with your workmates, I think they're getting a pretty good deal out of it if they get to eat all your fantastic creations! Holy moly craziness! I haven't had Rolos in ages, oh how I miss childhood treats.. 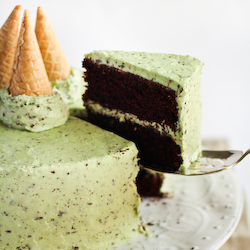 This cake looks amazing. Now how do I become one of your workmates? Oh my God those photos are amazing! This is a perfect cake to celebrate with once I make it through the ordeal that will be this week! Perfect timing. I much prefer the taste of Cadbury Caramello (better quality chocolate I think), so I'll break up a block of that instead. Oh now this is mean. 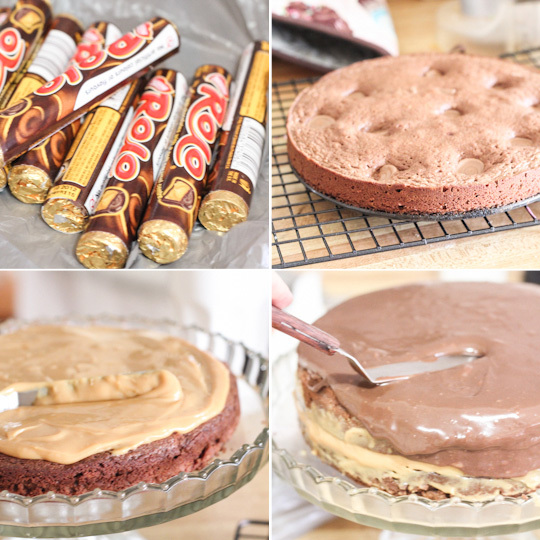 All im going to think about is Rolo cake now!! just wanted to say I love your blog. Every Monday I religiously check to see your new recipes and photos, you are a talented baker! Wow!! The cake looks amazing! So chocolaty and rich! and Rolo!!! and DDL!! am dreaming about a layer of rolo filling in between the layers now! OH BABY YOU ARE EEEVIL!!! OMG they would be awesome! (I actually prefer them to Rolos, I'm a choc mint fiend) You could replace the caramel in the centre with more of the chocolate ganache from the outside and add peppermint extract to that. Alternatively you could just put a layer of the peppermint rolos in the centre. Or make a simple peppermint icing using icing sugar, butter and peppermint extract. OMG wow, that looks deliciously evil! But so good as well. Wonder what I have coming up that I can make this for! Oh wow, amazing! I'd be happy to have a slice or three of that any day! 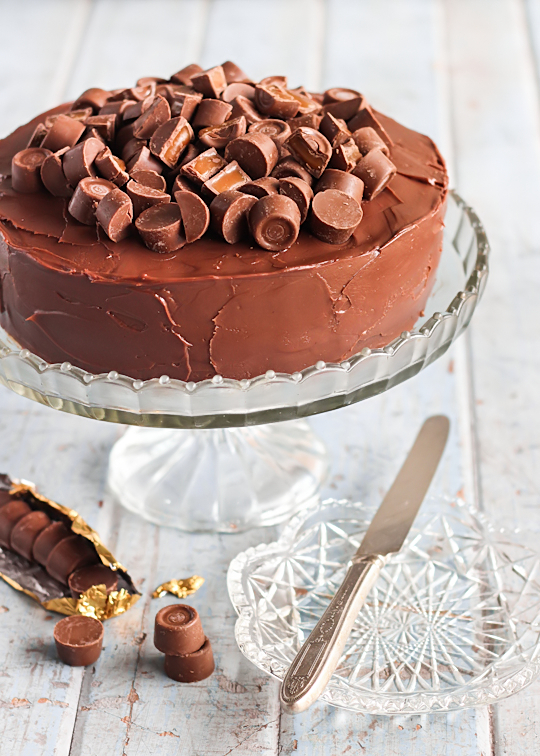 I *love* the choc/caramel combo - when I was younger I used to bake chocolate cupcakes/cakes and put rolos in them... now that I'm all grown up I should try your super-decadent rolo choc cake!! I don't feel anywhere near as bad now about being a bad wife and not baking him a birthday cake. Thanks for letting me off the hook Steph! This looks ridiculously delicious. 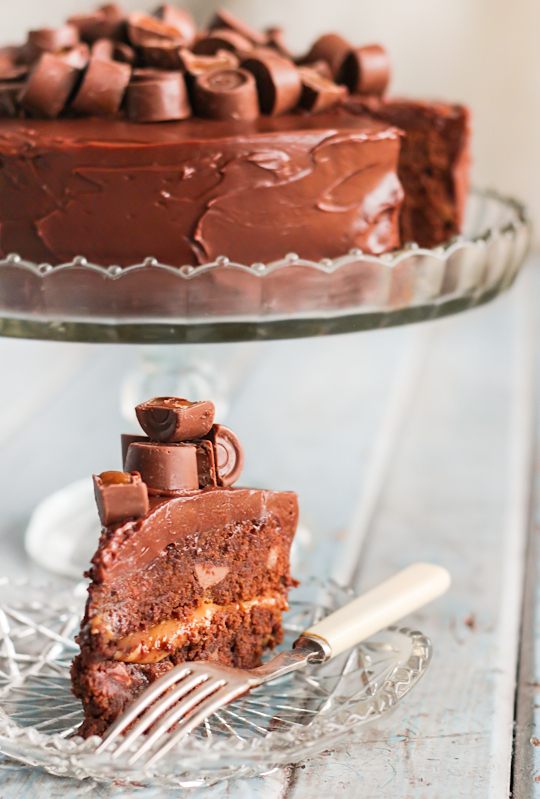 I love chocolate and salty caramel in any combination and the idea of rolos baked into a brownie then layered with more chocolate and caramel sounds immense! Rolos are one of my favorite candies. They are so delicious! 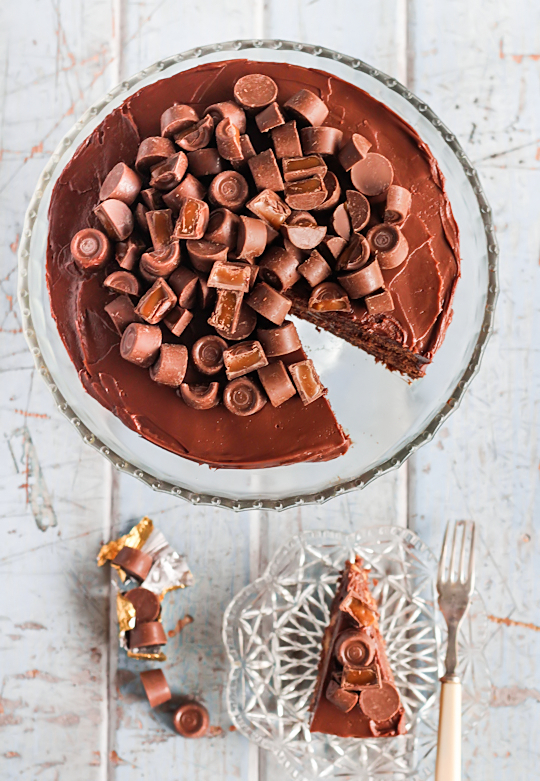 Rolo chocolate brownie cake? I must be dreaming. When I have a Rolo I can never just have one. I love this cake. Thank you for the recipe. Well would it be too late to join your already huge group of fans? Amazing pictures and I'm sure the cake is going to taste equally amazing. I suffer from high sugar anyway so I have told myself not to suffer anymore and indulge in sweet pleasures in life like this! Looking forward to more... and in the meantime I'll slowly savour each one of your previous recipes! Oh. My. God. I think I just put on a stone looking at it! I'm a massive fan of the "rustic" finish ;) I love what you do with chocolate bars, I really do. this is some serious decadence!!! am still staring at the cake!! You have a way of making things that are already nice i.e. Rolos, taste even better! The cake looks amazing. I would love to try some! man i wish i had someone make me this for my birthday. I think i would have died and gone to heaven. amazing. What and amazing and decadent cake! But I believe you when 1 or tops 2 slices are enough:-) I'm going to start a monthly party at my blog and would love you to join. Check out my blogg from 1st of May for more info. Wow this looks intense but so good! I made this cake over the weekend for a friends dinner party! It was absolutely heavenly!! Trying to think of the last time I had Rolos now...! If you're from Norway, dulce de leite tasts just like HaPå, which is cheaper then condensed milk and doesn't require prep. Try lowering your oven temperature a smidge, it helps the cake rise more evenly. Also I usually rotate my cake tins 180 degrees about halfway through the baking time to help them cook more evenly within the tin. What a great idea including the rolo's. This looks delicious Steph! i tried making this yesterday! was fairly successful, but both my cakes would not cook all the way through!!! i cooked one of them for an extra 30mins and it was still sloppy in the middle... any idea where i went wrong? Hmm not sure. You might need to increase your oven temp? The cakes are meant to be fudgy in the middle but not sloppy, and they should cook a little extra even after you take them out of the oven. Either that or there wasn't enough flour in the batter maybe? Hard to say. Sorry you had troubles with it! Gorgeous! Rolo was one of my fave chocs when I was younger. I dont see them as much these days though. Love! I've just stumbled across your blog today and absolutely love it! This cake looks stunning. I used to love eating Rolos when I was younger but they don't sell them where I live now. It's a great idea, though! Thanks for your creativity! I am going to get creative myself and adapt this to a reese's peanut butter cups extravaganza for my husband's birthday... I'm thinking miniature cups in the cake batter, peanut butter filling, and lots more cups to decorate as you have done with the rolo's... fingers crossed! Just found your blog and its lovely. 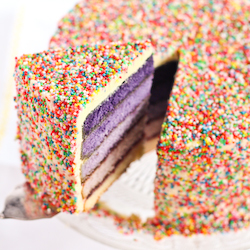 This cake is amazing looking (just like the rest of your food! )This is getting made pronto. Thanks for the recipe. I could not resist making this! Figured I would bring it to work, just for fun. My co workers went "Oh and Ah" all the time and were not able to wait for coffeetime to have a slice. Their comments made my day. "Wonderfull, amazing, fantastic". And the best: "Devine". So thanx for sharing. I cant wait to make more delicious food from your blog. This is in the oven right now - wow! Cannot wait to serve it. Thanks for sharing! thanks for sharing the recipe and your site is great! I'm gonna make this for my birthday! Can't afford to buy cakes anymore! This cake is so completely GORGEOUS!!! Even my hubby and son can't wait to sink their teeth into it! Thanks for posting this. I want do it for my sister-she has birthday..